This snickerdoodle scrub smells so amazingly delicious! Go ahead and make a double batch, you won’t regret it. Winter has me on a sugar scrub kick. My skin gets so dry when it’s really cold outside! 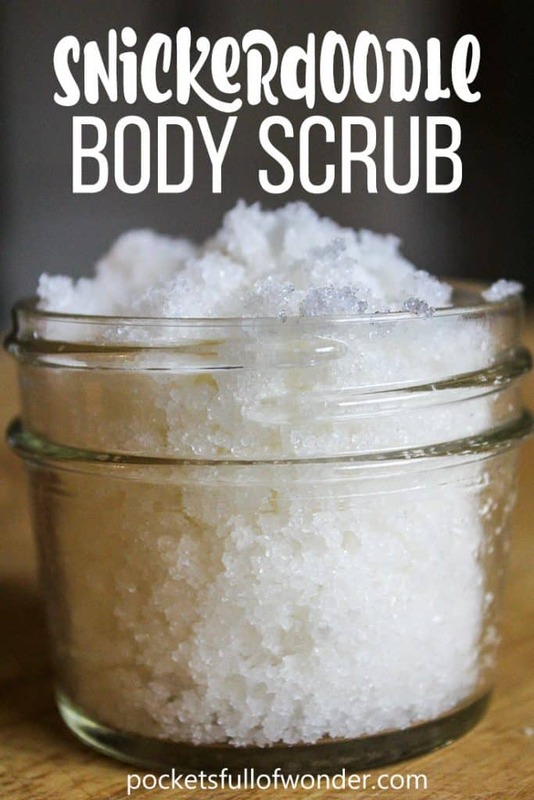 And I love how a sugar scrub gently exfoliates while moisturizing. I got the idea for this scrub while filling diffusers one day. I wanted a yummy, cozy scent and went for vanilla essential oil combined with cinnamon essential oil. And it smelled so amazing, I wanted to find another way to use this combo! And a scrub is the perfect way! Not all essential oils are created equal. Be sure you are using 100% pure essential oils from a brand you trust. I like Plant Therapy . 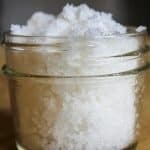 Extra virgin (regular) coconut oil is solid below 76 degrees F., but fractionated coconut oil stays liquid. You can use either, but I prefer fractionated coconut oil because it’s more consistent and has a longer shelf life. Some people experience sensitivity to coconut oil. Good alternatives are sweet almond oil and grapeseed oil. Be careful in the tub and shower. Oil based bath products can make your bathtub slippery. Vanilla essential oil and cinnamon essential oil are both VERY potent. I don’t recommend using more than a couple drops in this recipe. This sugar scrub is the perfect sweet treat for your skin. Starting with 2 tablespoons coconut oil, add to sugar and mix completely. Add and mix additional coconut oil, a little at a time, until the desired consistency is achieved. I like body scrubs to have the consistency of damp, but not wet, sand. Once you have the desired consistency, add your essential oils and mix well. This doesn't contain any preservatives, so treat your skin by using this generously!